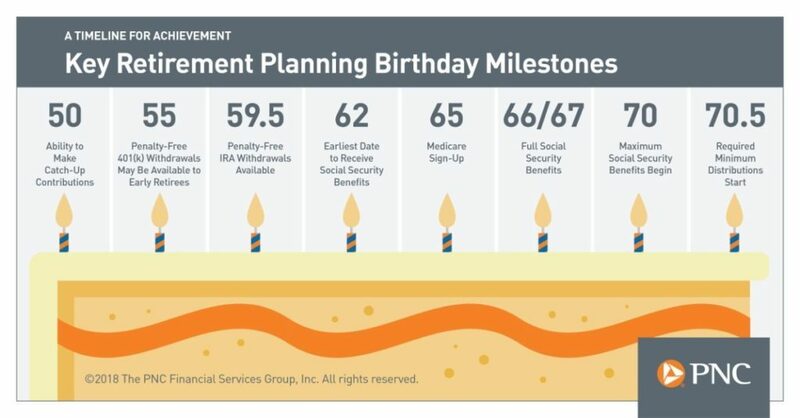 A friend recently sent me this link to a chart on PNC Bank’s website titled “A Timeline for Achievement” that provided a helpful list of age-based retirement planning milestones. 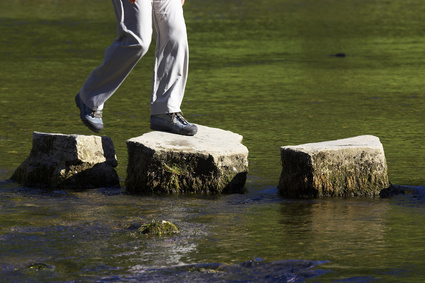 I think milestones are a great way of tracking our progress through this life. We have our different ways of “marking” things like the development of our children (first step, first word), birthdays and anniversaries, even special stops and moments along a journey. As we age, we pass many of life’s milestones, and we would do well to pause and reflect on God’s sovereign and providential care in “bringing us this far.” And certainly, some are more momentous than others. Although some of us may not have as much fun commemorating them as we used to, our birthdays are also key milestones in our lives. As it turns out, they are also important milestones that are used by the federal government for retirement planning purposes. As you can see from the graphic, the milestones start at age 50 and end with age 70.5. Each of them is an age at which the U.S. Government—either the IRS or the Social Security Administration—has decided that you can begin a particular type of withdrawal or start receiving some benefit. Most are optional (such as early withdrawals), and others are mandatory (such as the Required Minimum Distributions at age 70.5). Okay, it’s hard to argue with this one. If you are getting into your 50s and need to play some catch-up, then this is absolutely one to take advantage of. But what if you are saving (or have saved) enough? This is true, but it pertains only to 401(k) type plans, not IRAs [including money that you may have rolled-over into an IRA from a 401(k)]. Although you don’t have to be unemployed, you must not be employed any longer by the employer with whom the 401(k) is affiliated. Also, you have to have left that employer either during or after the year you turned 55. But one thing is for sure: 55 is VERY young to start withdrawing from any retirement savings account. Any money you take out can’t continue to be put to work earning you compound interest. If it’s an absolute necessity, then, by all means, go for it. If not, then be very careful not to put your future at risk by withdrawing too much, too soon. But I’m not sure it’s time to celebrate unless you have a lot of savings. If you are forced to start withdrawals at age 59 ½ due to poor health or job loss, and continue doing so for the rest of your life, your chances of running out of money before you run out of life go up significantly. But, if that is your only safety net due to job loss or illness, and you are unable to go back to work, then you have to do what you have to do. Just try to withdraw as little as possible and to delay Social Security for as long as possible if you can—you will need the maximum benefit in the future. Also keep in mind that you may also qualify for Social Security Disability (SSD) benefits, which you can receive until you reach the Social Security Full Retirement Age (FRA). If you start early withdrawals voluntarily, perhaps to help fund a different career path or to volunteer your time, be careful. 59 ½ is very young, and even if you have a large balance, it may not be wise to start withdrawing from them so young. Doing so will most certainly reduce the long-term value of your portfolio. This is particularly true if the years immediately following are a bad one for the market—that could result in losses you might never be able to recover from. As with early withdrawals from a retirement savings account, if you absolutely need to start taking early SS benefits, then do it. But in the majority of cases, it is much better to delay, as PNC also points out. Surprisingly, the current average age people start receiving SS benefits is 63. So, most people wait, but they don’t wait very long. There is a general guideline that I think makes a lot of sense here: The more dependent you will be on SS to provide a portion of your income in retirement, the more critical it is to delay receiving benefits as long as you can. It can be very tempting to start receiving benefits as soon as you become eligible—I get that. But before you decide, make sure you fully understand the long-term implications. An illustration may help: If your FRA at age 66 is $2,000/month, then your benefit at age 62 will be $1,500 (.75 x $2,000). If you wait until age 70, your benefit will increase to $2,640. Therefore, the “payoff” for delaying is $1,140 per month. If you live 20 years, to age 86, that is an additional $273,600 in total benefits, not adjusted for inflation. For some, that could be the difference between being able to retire with dignity or not. Oh happy day indeed, especially if you haven’t been covered by an employer-sponsored healthcare plan up to this point. Perhaps you retired early or lost coverage due to a layoff, or maybe you’re self-employed. No matter what, as long as you qualify, you can start receiving Medicare benefits beginning at age 65. And it is very likely that Medicare Parts A & B will cost you less than what you’ve been paying. However, if you also sign up for a Medicare Supplemental Plan (a.k.a., “Medigap” coverage) and also supplemental plans for prescriptions, dental, and vision, your costs may be higher than you thought they would be. You also have the option of signing up for a “Medicare Advantage Plan,” which is known as “Part C,” that rolls all these together. PNC is right to remind us that timely enrollment is essential; failure to do so can result in higher premiums. If you are continuing to work, you can enroll in Medicare Part A at no charge, even if you continue to participate in your employer plan. It is fascinating that when Social Security was enacted back in the 1930s, “full retirement age” was set at 65, even though the average life expectancy at the time was about 45. It has changed very little (it’s now at age 66/67), even as people are living longer and longer. I wouldn’t be surprised to see it increased to age 70 sometime soon. Whether you decide to start receiving FRA benefits depends on a lot of different variables that affect your situation. Many financial planners suggest that you strongly consider delaying benefits until age 70, especially if you will be relying on them to provide most of your income in retirement. That’s because your benefits, which are paid in a “guaranteed,” inflation-adjusted, lifetime annuity, will increase 8% a year between your FRA and age 70. There is no benefit in delaying past age 70. Not much to say here. Even if you’re still working, there’s no reason not to start taking benefits. Of course, with the additional income, some percentage of the benefits may be taxable, but it wouldn’t make sense not to take them so that you don’t have to pay the taxes (unless the taxes were higher than the benefit). I guess you could be in a peculiar situation where the Social Security would put you in a much higher marginal tax bracket that it would pay you not to take them, I’m not sure how that could happen under our current tax structure. The tax man cometh! Sooner or later the feds will come for their share of your IRA pie, and RMDs are their way of doing it. Currently, the minimum withdrawal percentage starts at 3.65% and then increases each year. You may be thinking, well, what if I don’t need the money; can’t I just leave it alone. Well, you could, but then the tax boys will hit you with a tax penalty of 50% of what you should have withdrawn—ouch! Apart from the “render to Caesar what is Caesar’s” aspect of this, because of the increasing required withdrawal rate, it is highly likely that the residual value of your IRA will be substantially reduced over a long retirement unless you have spectacular earnings. The last milestone, which isn’t featured on the chart, is our “last” birthday, which means that we have left this earth. At that point, none of this matters anymore, except to the extent that your decisions either benefited or harmed those you leave behind. So, when making decisions at each milestone, best to keep that in mind.